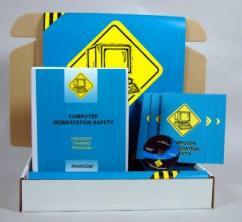 MARCOM's "Computer Workstation Safety" Safety Meeting Kit™ reviews the safe use of computers, and offers practical solutions to many potential problems. Today much of the work we do involves computers, whether it's in the warehouse or in the accounting department. And just like any other type of equipment, we need to know what potential problems may be involved in working with computers as well as how to use computers safely. Materials in the kit include a video program, five motivational posters, and 30 booklets. The posters in the kit remind employees to work safely and avoid injuries when working with computers. The videotape and booklets in the kit includes information on the organization of work materials, maintaining "neutral" positions, positioning the back and torso, avoiding and relieving eyestrain, avoiding and relieving muscle strain, tension and stress reducing exercises, and more. The video program in the kit comes with a comprehensive leader's guide, reproducible scheduling & attendance form, employee quiz, training certificate and training log.